US Transportation secretary won't ban cell phones on the road, hand-free calling "not the big problem"
Texting while driving is probably one of the best methods to get into a car accident and by now 35 states have already imposed a ban on it, but a couple of weeks ago the National Transportation Safety Board (NTSB) looked at some studies suggesting that even talking via a Bluetooth headset or any other thing you’d do with your phone while driving is no different than texting and is equally distracting. After that, the NTSB issued a radical recommendation to ban all cell phone use while driving, something that might seem far fetched for some. For those of you who want to continue using their cell phones reasonably while driving (and that would limit most of the use to emergency situations), you can breathe a sigh of relief - the US Transportation Secretary Ray LaHood said he won’t endorse NTSB’s recommendation. LaHood clarified that he speaks about hands-free calling, which "is not the big problem in America," and "if other people want to work on hands-free, so be it." The NTSB is a federal agency but it doesn’t have the power to enforce rules, and can only give recommendations to the government. No state has a full ban on use of cell phones while driving. Your so way off base! 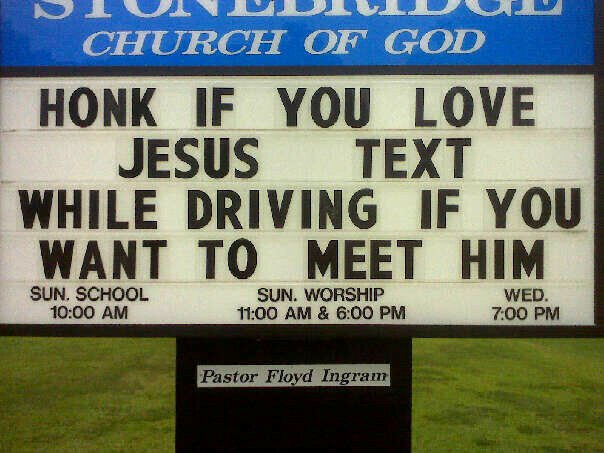 the problem started with texting! NOT talking on the phone! silly! this wasnt a problem til texting became more of a daily thing, people have been talking on the cell since begining of 1990's, and yes there were not as many as now, but CB's were in use since 60's 70's and even now, never heard of them getting in, or causing accidents! Perhaps points on the driving record is what is required? Anybody can pay a fine. Points however can lead to: increased car insurance, potential driving restrictions, driving license removal. Points could have more of a "lasting" impact. hey, maybe you should read the bible! silly! then you would have answered your question, Jesus is GOD ! Talking on a cell phone is no more distracting or dangerous than talking to a passenger in your vehicle. Bad drivers are just that, stop using the "distraction" as an excuse. It kinda is though. You have to look down to dial the number. And you know how most elderly, asians, and women are not the best of drivers to begin with. So you would want these groups to have both eyes on the road at all times if you're driving anywhere around them. Of course there are exceptions to the rule, but when they make a law, they make it for everyone across the board. They can't single out certain groups. PS- this isn't meant to be a racist statement, so I aplogize if you fall into one of those groups and you THINK you're a good driver. But 90% of drivers would agree that the majority of those 3 groups make up the most hazardous drivers on the road, especially here in NY.